Dr. Dava Newman, Apollo Program Professor of Astronautics at the Massachusetts Institute of Technology (MIT) and the first female engineer to serve as NASA Deputy Administrator, visited Wake Forest this week. During her multi-day visit, she met with students in small groups for career advising lunches, visited classrooms to discuss her work, gave a technical lecture to faculty and students in the Department of Physics, and spoke to a packed audience in Porter B. Byrum Welcome Center to the public about the necessity of aeronautics and astronautics research. 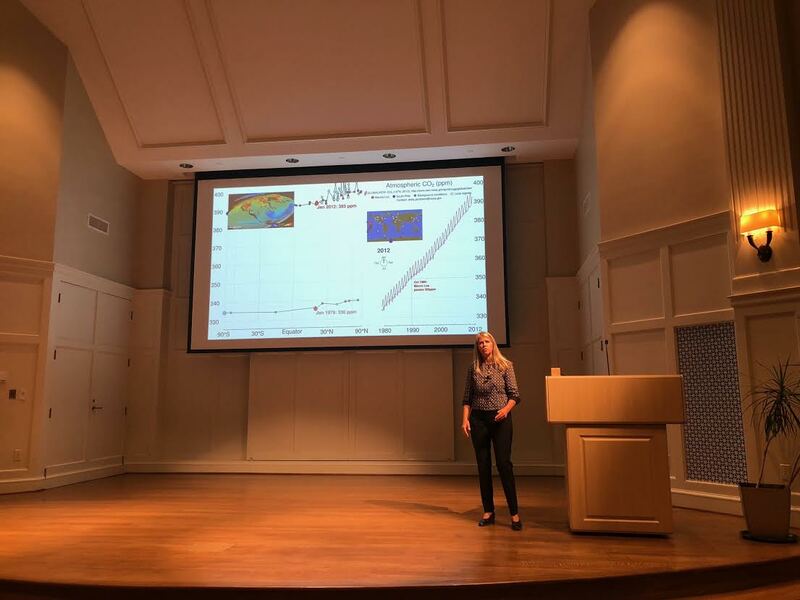 She began her first talk, on Monday September 24th, with two fundamental questions, “Are we alone?” and “Are there other habitable planets?” Newman described the discovery of over 6,000 exoplanets — worlds around stars outside our solar system. Two thousand of those are documented in varying levels of detail, she said, but just two dozen are dubbed “goldilocks” planets — not too hot and not too cold; they are just right to potentially support life. Newman believes that these ‘Ocean Worlds’ contain substantial amounts of water on or within them, and are the best place to look for organic life. An exciting discovery, Newman continued, is that Mars has ice and water, similar to underground lakes on earth in Greenland and Antarctica. Because microbial life is known to persist in these lakes on Earth, researchers are excited about the potential for microbial life on Mars. Newman’s career has been dedicated to the eventual human exploration of Mars. Her research focuses on protective gear for astronauts leaving the hospitable “spaceship” we live on, Earth. “Plan B is not colonizing Mars,” Newman said. Though space exploration is an important enterprise, humanity’s goal should be actually figuring out how to live harmoniously on Earth. Shedding light on worrisome facts due to global warming, Newman explained the detrimental effects of the rise in carbon dioxide levels, which have reached unprecedented proportions since the beginning of the industrial revolution. Her message was clear: our top priority is combating climate change to keep Earth as a viable habitat. “I think she highlighted the most important points in the fact that Earth is our home, and Mars is not the new earth. It is just a place for exploration,” said sophomore Grayson Reed. Exploring Mars was the topic of her second talk in the George P. Lecture Hall of Olin Physical Laboratory on Tuesday, September 25th, titled “Human Exploration from Earth to Mars: Becoming Interplanetary.” NASA currently has some technological limitations for space travel beyond Earth’s orbit, according to Newman. One problem involves safely landing a capsule with astronauts on Mars, whose atmosphere is one percent as dense as Earth’s. Newman played videos of previous versions of landing gear for robotic landers. One video demonstrated a hard landing using rocket thrusters that slowed descent — a landing too hard for human passengers. Another video simulation showed a lander bouncing off the surface surrounded by a bubble of air bags. Newman then focused on a second issue: spacesuits. Calling them “the smallest spacecraft,” she explained that the extravehicular activity (or EVA) suits NASA currently uses are the same as those used during the Apollo missions, which ended in 1972. The outdated technology is one of the biggest hurdles facing a Mars landing. Newman’s research at MIT involves developing the next generations of space suits. The current EVA suits impair astronauts’ abilities to perform surface missions, she explained. Their inhibiting range of motion prevents astronauts from doing simple tasks like collecting soil samples. To tackle the suit problem, Newman’s research group is focusing on key improvements to space suit technology. One image she showed features an astronaut squatted in a lean space suit colored like Buzz Lightyear. Newman explained it as a slim-fitting suit that eliminates skin and joint strain by incorporating ergonomic creases. The folds act like pre-applied wrinkles that fall along physiological lines of zero stress on our skin, which eliminates tugging on astronauts’ bodies (imagine being completely unrestricted with your shirt tucked in). These advancements may seem insignificant but — for astronauts in the cold, inhospitable, vacuum of space — mobility could be the difference between life and death. After both talks, Professor Newman patiently answered questions from attendees. Her message to students and faculty alike was, in essence, a call to action to follow their passions, whatever they may be. Newman is optimistic that today, almost 50 years after astronaut Neil Armstrong landed on the moon and said, “One small step for man, one giant leap for mankind,” that people from all over the world can work together to solve global warming and other collective problems. Humans can push the frontier of knowledge and boldly learn what no one has learned before — like whether there is life outside of earth. Jonathan Trattner also contributed to this article.